Mary Ann Dodge from Woburn perused a book being offered at an estate sale in Lexington last month. LEXINGTON — At dawn, the cold eastern sky is a majestic, rippling tableau of flaming orange, deep purple, and soft rose — a luminism worthy of the grandest of the grand masters. But Beth McNichols has no time right now for this breathtaking celestial sea of sunrise color. She’d arrived at 5:30 a.m. Friday, time-stamping her position as first in line with her phone. Her eyes are not skyward. They are fixed squarely on the front door as 40 well-bundled fellow treasure hunters fall in behind her along the rough-hewn steppingstones of the short front walk. In the shopper’s equivalent of a three-point stance, she’s ready for the estate sale here at a home tucked up and away from Lexington’s Battle Green. That door will open at 9 a.m. and masterpieces of a different kind dance in her head. McNichols runs BakerBaker, a West Roxbury bakery that’s her passion and full-time job. But this — this business of picking through and poring over other people’s stuff — is her beloved avocation. And like many of those in line behind her, she’s an old pro at what’s become a booming business — propelled in part by television’s echo chamber of antique treasures and the allure of hidden bargains buried in storage sheds and on pawn shop shelves. 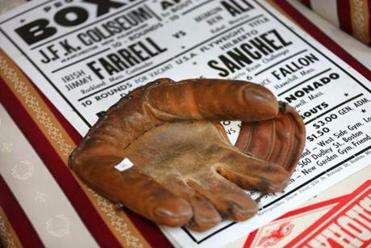 An ancient baseball glove was for sale in Lexington. At the estate sale here last weekend, there was a women’s set of Ping golf clubs for $75. A special edition of a Polaroid camera, $24. A bronze figurine of a boy playing the flute, $250. An oriental carpet, $1,500. There were $5 belts and $15 boots. There were $10 shoes and $5 sweat shirts. The patio furniture outside was going for $250. A Henry F. Miller piano in the foyer was all yours for $450. Pony up $1,200 and you could take home a late 18th-century banquet table. 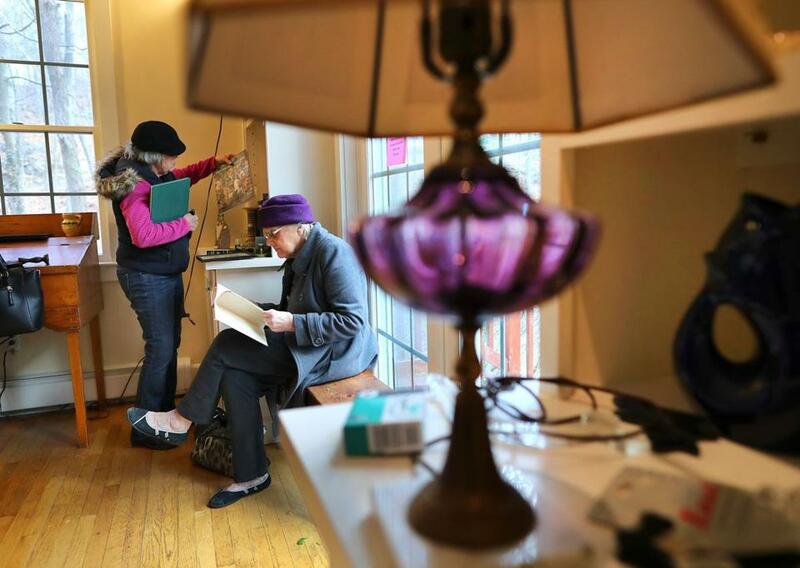 “I just had a ridiculous amount of stuff,’’ said Laura Sanford, a lawyer specializing in mental health litigation who has lived in the rambling yellow Colonial with a free-standing office here for 31 years. Her husband, Dr. C. Anthony Martignetti, a writer and psychotherapist, died in 2015. Now it’s time to go. Sanford said she interviewed four or five estate sale specialists, an anxiety-producing process that subsided only after she sat down with Ellen Downer and Joan McKinnon. In them, she found two women who convey the kind of calm and solid confidence that you’d want in someone you’re entrusting with the possessions of a lifetime. Their business, Estate Sale Specialists, was started on a handshake five years ago. Downer, the mother of two grown sons, is married to a full-time art and antiques dealer and she’s been working in the business for 20 years. McKinnon’s father operated Miss Flynn’s Antiques in Wellesley Hills. She got the bug — and her auctioneer’s license — at 18. “A lot of customers tell us it’s an addiction,’’ Downer, 57, said. But after Beth McNichols bursts through Sanford’s front doors on Friday morning, followed by a passing parade of shoppers that would eventually grow several-hundred strong, it’s clear who is in charge. If Downer and McKinnon have the air of specialists who have seen it all, it’s because, well, they have. Buyers who walk in and purchase an entire room for their rental down on the Cape. An unwelcome customer known for sticky fingers. A hoarder’s house that took two weeks to clean. They once found $40,000 in a desk drawer in Dorchester, cash stuffed between napkins from the Christmas Tree Shops. (It was promptly returned.) And someone once put an offer on their half-eaten breakfast. Um, the coffee cake is not for sale. They go through everything, even shaking out the pages of each book they’re selling. If they have to be blunt, they can be blunt. Those Hummel figurines that your parents collected? Worthless. That heavy big brown furniture that’s been in the family forever? Sorry. In this Pottery Barn, Crate & Barrel culture, nobody wants it anymore. A tea set was available during the sale. In most cases, “estate sale’’ is a misnomer since only about a third of their business falls truly in that category. Mostly they’re selling belongings of those seeking to downsize and simplify. “The kids are gone and the kids don’t want this stuff,’’ McKinnon said. She and Downer have presided over a 2016 sale for former governor Deval Patrick in Milton and were in charge when the Fannie Farmer house in Harvard, where the culinary legend once lived, was open for the public’s perusal, also in 2016. Their average fee is 35 percent to 40 percent of the sale’s total. A comfortable living, they called it. And now they are putting that ethos to work at Sanford’s house. I do, too. I have a lot of it. Except none of it’s for sale. It’s what I sit on and eat on and sleep on. As I toured the house I wondered what it would be like to be an estate-sale regular. I imagined the look on my wife’s face if I brought home that pair of what we’ll call lightly worn boots for her, a steal at $15. Her: Tempted to use those mildly scuffed boots as a weapon, not a fashion statement. I saw a sturdy hammer on a hook over a work bench in the cellar. It was priced at $1 and if I knew how to use one, I would have grabbed it. It was there that I bumped into Armand Andreassian, a genial man who never stopped smiling as he examined a porcelain tureen shaped like a fish. He appreciated what I did not. Andreassian calls himself a full-time pack rat and a part-time dealer. 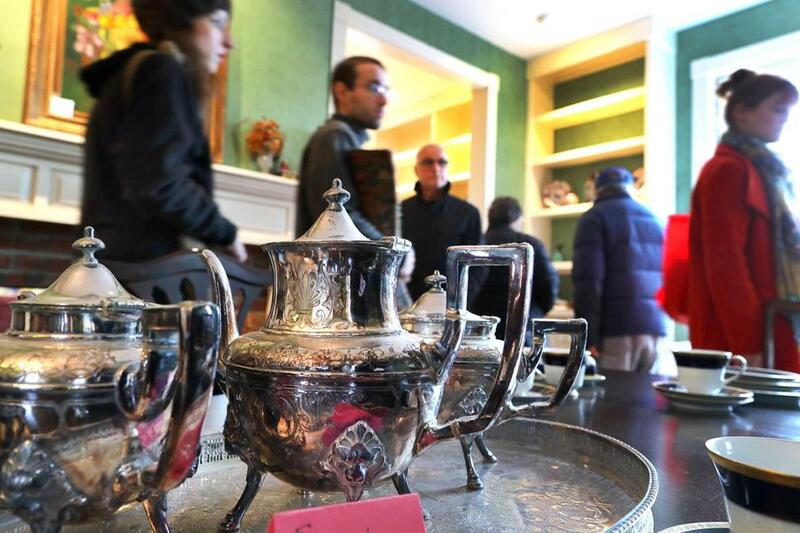 He bought his first piece (a silver tureen) in 1969 while he was still in his teens and a student at McGill University. And, yet, here he is in the bowels of the estate, prowling the outer basement. Next to the boiler he’s found a gem: a red ornate Christmas tree skirt. And wouldn’t you know it? It’s exactly what he needs. 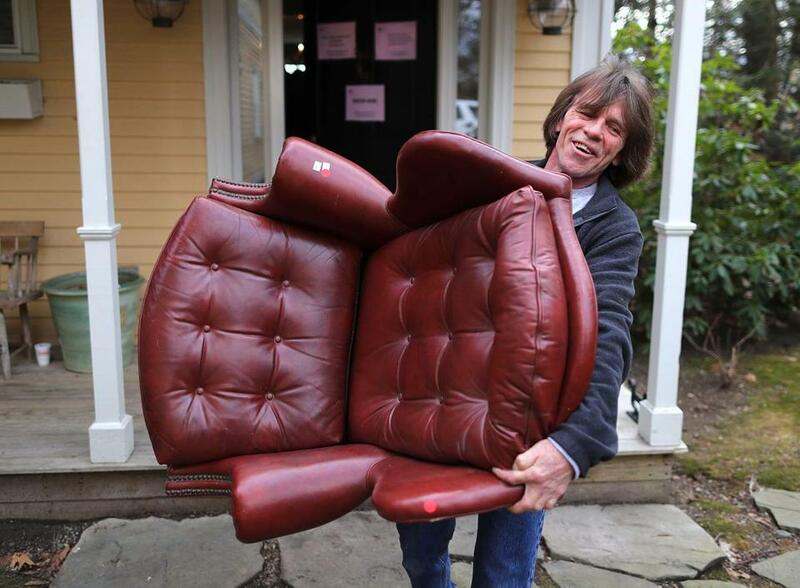 Estate sale workwr Bob McMillen carried a leather chair to a customer's vehicle. Thomas Farragher is a Globe columnist. He can be reached at thomas.farragher@globe.com. Follow him on Twitter @FarragherTom.